We stayed in the sun cottage and really loved it. We toured all the rooms and all of the rooms would be nice but we think the cottage was the best. This property is quiet and peaceful and has a terrific view of Travis Lake. There's lot of sitting areas around the pool and outside the cottage. Hosts Cata and Doug have created a welcoming sanctuary where travelers can rest, relax, and restore their bodies, minds and spirits. Their creative attention to every detail of this wonder-filled sacred space enchants one's senses and feeds one's soul. We felt welcome and at home with these gracious hosts. I have Celiac Disease and must eat gluten-free and dairy-free.The continental breakfast they prepared was delicious - fresh baked muffins, fresh fruit and almond milk as well as organic orange juice. I'm a coffee snob and the organic coffee they provided was delicious! We enjoyed drinking our coffee on the deck of our Lavender Suite or at the kitchen table surrounded by the lovely decor of this charming suite. We did not want to leave and will definitely return. Casa del Sol is an oasis in today's turbulent world. We had a great stay. Everything was as described. The twin bed is well a twin and there is a cabinet overhanging on one side, so us being two one of us slept on the couch which was comfortable. It was in the 40s at night and quite chilly inside the RV, but we kept on turning the little heater on, which worked marvels. This was our first time staying at a bnb, so we weren’t sure what to expect but everything was perfect! The ambiance, location, room, everything was great! We fell in love with the beautiful and peaceful scenery there. We didn’t want to leave. Will definitely be going back soon! I was well aware of the tiny accommodations when I booked this BnB. I was cute as heck, lovely in every way possible. The owner is very welcoming. She stocked the Airstream with lots of fantastic organic breakfast item and some home made pastries that were spectacular. The airstream is a tiny camper in a woodsy area of Austin. I couldn't have asked for a better weekend getaway. We had the pleasure of staying in the Armadillo airstream this past weekend and my only regret is that we couldn't stay longer. The little trailer is straight out of a Pinterest dream and the accompanying pastries and roses waiting for us, solidified our joy. The little details found all over the property truly made this b&b a treasure and you can tell that the owners have put their heart and soul into making Casa Del Sol special. We have already told multiple friends who plan on staying here and we are planning on our return trip when it gets warmer so we can enjoy the beautiful pool and try another one of the rooms (although it's going to be hard to top the Armadillo). If you have any hesitation about the idea of staying in a trailer (like my husband initially did)....please don't think twice! You wont be sorry! CDS amazed us in all of its beautiful details. From its quirky gardens and pool area to the whimsical touches throughout the room, there's no cookie cutter hotel experience here. We spent hours on the back deck enjoying the views. The continental breakfast in room was perfect as it could be enjoyed on our schedule not the kitchen's. The hosts were friendly and have us our privacy, an ideal combination. We'll be back. 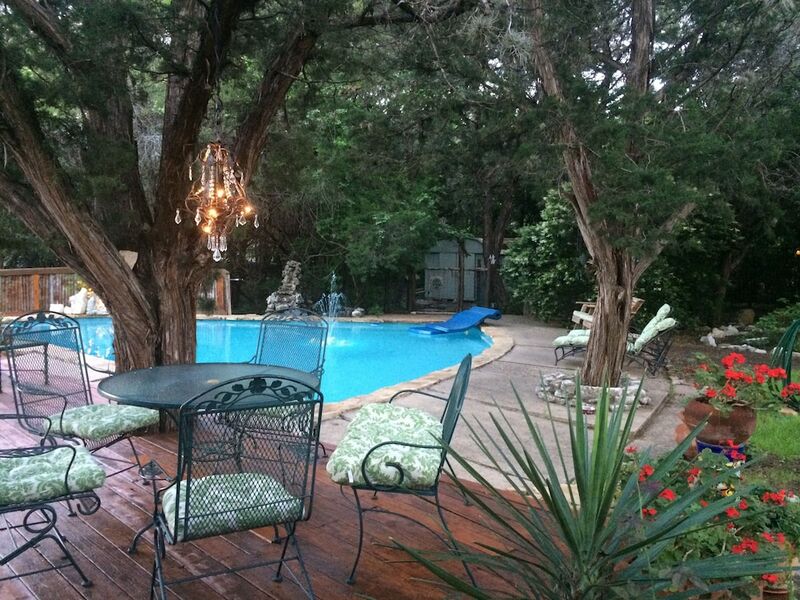 Casa del Sol is my favorite getaway and the best kept secret in Texas. It's hard to describe how special the vibe is -- peaceful but not boring, friendly but not intrusive, and just very, very chill. I've stayed there four times, once with my husband and three times by myself, and my husband has also been back by himself for a little solo vacay (well truthfully, he went with our dog--they're very close ;). I love all the rooms, each one is unique and charming without being kitschy, and stocked with everything you need to kick back and relax. My new favorite is the Armadillo, a little airstream that is just snug for one person and a perfect spot to get some reading or writing done. And the gorgeous private deck overlooking the lake with pool and hot tub is just a spectacular place to hang out. It's also very convenient--good restaurants and groceries minutes away, nearby trails to hike, and all the delights of Austin within a 20 minute drive. In short, when we need to get away--this is where we go. Casa del Sol Bed and Breakfast places you next to Lake Travis and within a 10-minute drive of other popular attractions like Hippie Hollow. This 5-room, 3.5-star bed & breakfast has free breakfast, an outdoor pool, and free in-room WiFi. Free continental breakfast is included with your stay and awaits you each morning from 6 AM to noon. A TV comes with cable channels, and guests can stay connected with free WiFi. The bathroom offers hair dryers, free toiletries, and bathrobes. Other standard amenities include a kitchenette, a patio, and a private yard. Limited housekeeping is available. Casa del Sol Bed and Breakfast offers an outdoor pool, a spa tub, and free WiFi in public areas. If you drive, put free parking to good use. Other amenities at this adults-only bed & breakfast include express check-in, a garden, and barbecue grills. Free continental breakfast is served daily from 6 AM to noon. The bed & breakfast has an outdoor pool and a spa tub. The preferred airport is Austin, TX (AUS-Austin-Bergstrom Intl. ): 40-min drive, 30.3 mi/48.7 km.